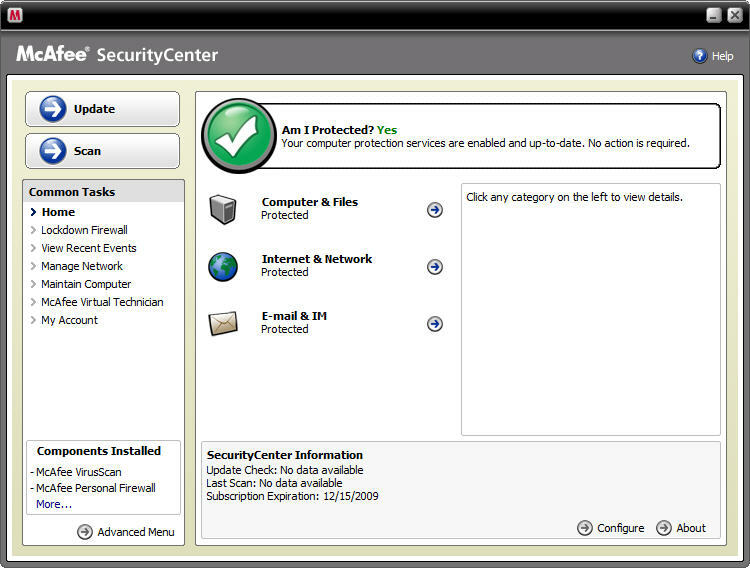 I'm using McAfee SecurityCenter 9.3 at PCs of home. 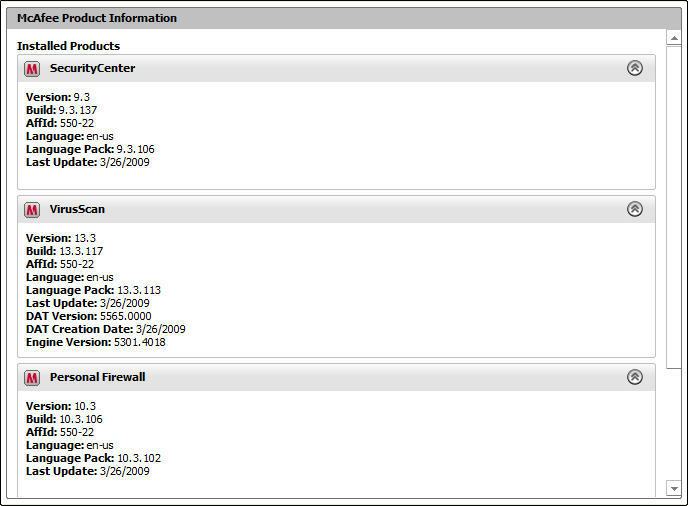 Recently I updated VirusScan at Vista 64 when the SecurityCenter popped up to update, but VirusScan doesn't work at all. Even I can't see the menu for VirusScan. Vista 32bit at home shows Scan Menu, but Vista 64 doesn't show correctly. To make matters worse, manual scan doesn't work. I don't know the difference of OS version causes this problem or there something else is. 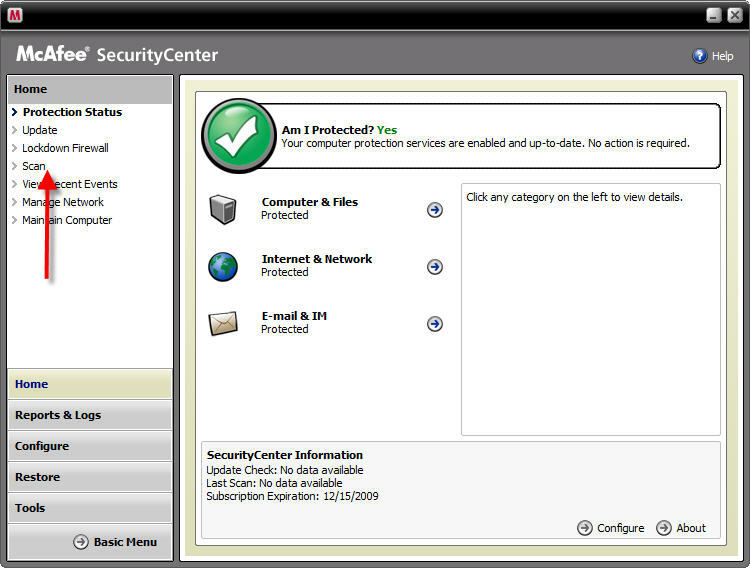 As you see the screenshot below, it goes back to Protection Status when I click on Scan. If you have same problem and fixed this issue before, please reply me. No screenshot but I'll guess. If You are running any of the beta versions of IE8 uninstall it. If you are running Internet Explorer 7 or 8 (final) go to Tools/Internet Options/Advanced and click the Reset button. OK and exit, Restart IE and re-enable all the add-ons under Tools/Manage Add-Ons. Go to Windows Update and make sure you are up to date with both critical and non-critical updates. McAfee is totally compatible with both Vista types. Somehow, the screenshot was not enabled but now it work. Well, I also tried that, but it doesn't succeed. I don't have IE8, IE7. I don't have much add-on, it was done quickly to reset. I also patched the latest updates. No Luck!!. I just checked your profile, you had it set NOT to show signatures and images, I altered that. However, the screenshots are still not displaying, to me at least. Can you try hosting them at somewhere such as Photobucket and then post the images using the bbcodes ? The blogsot you are using may not allow remote access. I don't know why it doesn't show the images for you, but I can see the images correctly from Firefox now. IE 7 doesn't show the images correctly when I checked it with my IE 7.0. I don't even see the image placeholders in my Firefox 3.0.7, but I at least see those in IE8 (final), this is in Vista SP1. However if I go to properties on each one and then display their URLs separately I can see the images....very weird. Anyway, from what you show the first ones look normal to me - I thought that you were getting blank Security Center images. The last one is an issue that I will have to research more. But I would imagine that McAfee was corrupted in the change from x86 to x64? Well, I followed your direction, and I run MCPR as an administrator. When I checked the folder C:\Program Files(X86) Still there are two folders named McAfee.com and McAfee. McAfee.com has some agent program is runnning, so I kill the process then I can delete the folder. For McAfee folder, I can't delete it so I reboot and delete it. I think I delete every files to reinstall the McAfee SecurityCenter, and reinstalled it. By the way, when I install it with DMSetup.exe which I downloaded after login, First, it download 54MB file and then It also downloaded 24MB and installed software such as SecurityCenter, VirusScan, Firewall, SiteAdvisor. I just realised you tried that. Try contacting Technical Support Chat linked in my signature. I found this from searching the forums and it fixed it for an XP person, not sure it will help here. 1. Check if MSXML3 and MSXML 4 is installed in the add/remove programs. 3. Have you downloaded the latest Windows update?